Luke Gronneberg | Sidney Daily News file photo Andre Gordon (right) and the Sidney boys basketball team are ranked 10th in the most recent Associated Press Division I state poll. Luke Gronneberg | Sidney Daily News file photo Bart Bixler (right) and the Anna boys basketball team are are ranked fourth in the most recent Associated Press Division II state poll, while Kyle Francis (left) and Marion Local are ranked No. 5 in the Division IV poll. 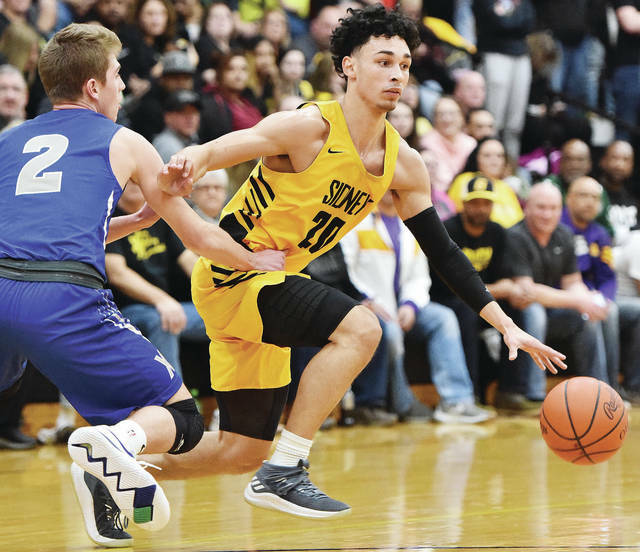 SHELBY COUNTY — All season long, the Sidney boys basketball team has been one of the best in the region. The rest of the state is starting to take notice. The Yellow Jackets entered the Associated Press Division I state poll this season — and what is believed to be the first time since the 1987-88 season — when the state polls were released Monday evening. The girls state basketball poll was released Tuesday evening. The updated girls state poll was not available in time for this edition of the Sidney Daily News. Sidney was ranked No. 10 in the Division I state poll. Also, Anna was ranked No. 4 in the Division III state poll. The Yellow Jackets were 9-1 entering Tuesday night’s game at Northmont. Sidney’s biggest win so far this season was a 51-46 victory at Butler on Dec. 18. The Aviators (10-2) were ranked No. 12 in Monday’s state poll. The two teams will meet again in Sidney Feb. 12 in a game that likely will have major Greater Western Ohio Conference American League North Division title implications. Also looking on the schedule for Sidney is a Jan. 25 home game against Trotwood-Madison, which was ranked No. 2 in the state for Division II in Monday’s poll, one spot behind Cincinnati Taft. The nine teams ranked ahead of Sidney were: Cincinnati Moeller, Pickerington Central, Toledo Whitmer, Hilliard Bradley, Akron St. Vincent-St. Mary, Dublic Coffman, Sylvania Northview, Marson and Lorain. Anna moved up one spot from the previous week in the Division III poll. The Rockets also picked up one first-place vote. The three teams ahead of Anna in the poll were Archnold, Wheelerburg and Canal Winchetser Harvest Prep. 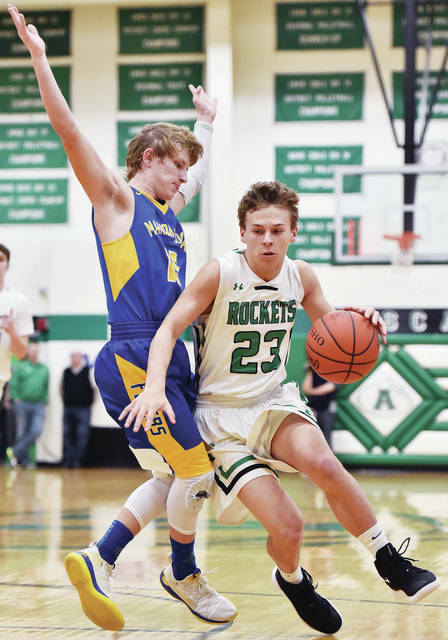 The Rockets picked up a huge victory Monday, knocking off St. Henry, the top-ranked team in Divison IV. The state poll was released before Monday night’s game between the two teams. On Jan. 5, Anna defeated Marion Local the No. 5 team in the Division IV state poll. Anna is 10-0 this season. The Rockets travel to Fairlwn Friday, then host Miami East Saturday. While the updated girls state poll was not available Tuesday evening in time for this edition, area teams were expected to be well-represented. In Division IV, Minster was the top-ranked team in the state, while Fort Loramie was ranked No. 2. Fort Loramie defeated Minster in double-overtime Saturday when the two teams played. Also in last week’s Division IV state poll, New Bremen was ranked No. 11, while New Knoxville was ranked No. 20. In last week’s Division III state poll, Versailles was ranked No. 5, while Anna was ranked No. 17.
https://www.sidneydailynews.com/wp-content/uploads/sites/47/2019/01/web1_gordon.jpgLuke Gronneberg | Sidney Daily News file photo Andre Gordon (right) and the Sidney boys basketball team are ranked 10th in the most recent Associated Press Division I state poll. https://www.sidneydailynews.com/wp-content/uploads/sites/47/2019/01/web1_bartbixler.jpgLuke Gronneberg | Sidney Daily News file photo Bart Bixler (right) and the Anna boys basketball team are are ranked fourth in the most recent Associated Press Division II state poll, while Kyle Francis (left) and Marion Local are ranked No. 5 in the Division IV poll.